“Half-truth” is same as “Half- lie” : New French lessons in primary PCI ! Many readers of this site might have wondered , about a series of biased articles pulling down the superiority of pPCI in STEMI. This French study (FAST-MI) throws stunning data from the real world. Initial Fibrinolysis* defeated pPCI in all aspects of coronary reperfusion ! 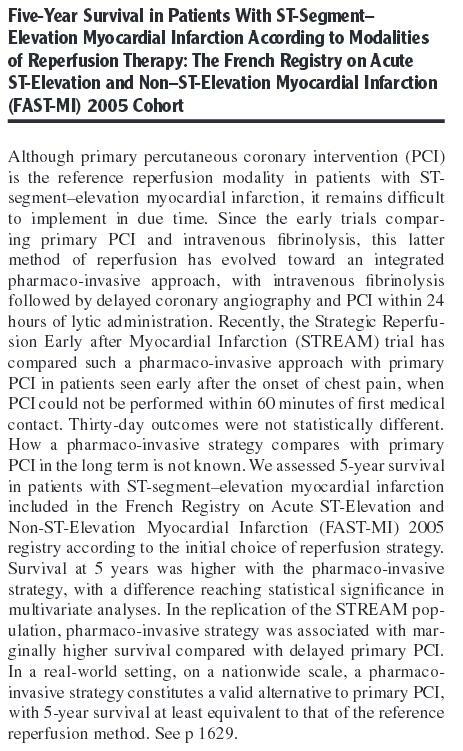 *When we say fibrinolysis arm it means Pharmaco -Invasive approach .Today our brain is irreversibly conditioned to believe standalone fibrinolysis is forbidden in STEMI . (Which I strongly disagree!) I am sure, very soon another stunning study will unmask the truth about standalone fibrinolysis as well ! The truth is , pPCI is really a superior modality in some of the complicated subsets of STEMI that too if performed fast. In all other situations Initial fibrinolysis will rule supreme ! pPCI is not an Innovation for mass consumption! Hence, “the roof top call” for pPCI for every STEMI is nether desirable nor feasible. Now, we have this evidence from France (Which was well known to us a decade ago) As always , truth takes time to arrive , while falsehood can come instantly ! In 2014 , after two decades of celebration of pPCI the flagship Circulation journal throws this Editorial !